Army Spc. Alan J. Burgess - Run for the Fallen New Hampshire, Inc.
24, of Landaff, NH; killed in action when a vehicle-borne improvised explosive device detonated near his patrol vehicle in Mosul, Iraq. Alan's frequent calls home from Iraq were a lifeline for his family. He was looking forward to getting home to see his son and his family. After his death, his family came up with a fitting tribute: buying telephone cards for his fellow soldiers to call their own loved ones. It's a gift Alan would have approved. "He was a generous, honest person who felt that life is too short not to have fun," said Staff Sgt. Walter Dellinger. Alan attended Lisbon Regional School up to his sophomore year and went on to graduate from Oxbow High School in 1999. He joined the Army in 2002, "because all his friends were doing it," said his father, Edward Burgess. He had a love of hunting, fishing and computers and was known for his big heart. "He was a good boy, a good father and a wonderful son. His needs were always last _ everyone else came first," said his mother, Karen Moore. Alan’s faith always played a strong role in his life. He had begun studying to become a Military Chaplain. Alan shared his believe with the people of Iraq and would trade Rosary beads for Muslim beads with them and would bring candy to the Iraqis he had become friendly with while deployed there. Alan was on patrol as a vehicle gunner in the northern Iraqi city of Mosul when he was struck by shrapnel and later died at a Mosul field hospital of severe head injuries. 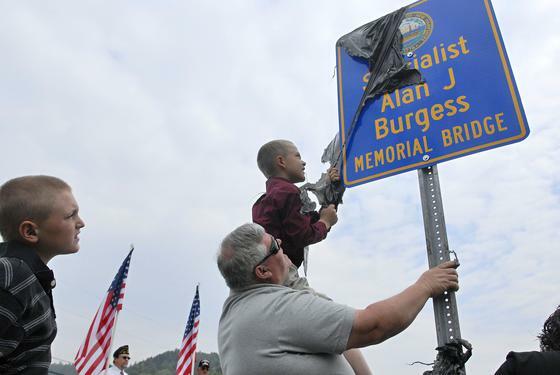 The bridge that carries Route 302 traffic over the Ammonoosuc River - a bridge Alan frequently traveled on his way to and from his home in Landaff - ,was dedicated in his memory. Family friend and retired highway patrol foreman Bob Clough knew both that the former Salmon Hole Bridge would be rebuilt, and that other communities around the state have renamed bridges for fallen soldiers. With the family's blessing, he went through the state Legislature's complicated process for renaming a road or bridge, which ended in both houses approving the bridge dedication. 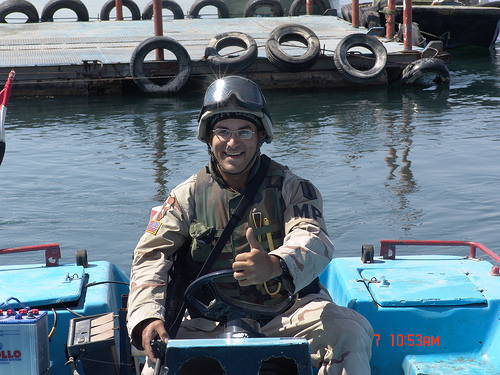 Following basic training, Alan joined his comrades in 2nd Battalion, 197th Field Artillery Brigade, Army National Guard as a Military Policeman and began training for his deployment to Iraq in support of Operation Iraqi Freedom. From this unit's home base in Woodsville, NH, he deployed in March 2004 to Iraq. Alan's expertise contributed greatly to his unit's successes. His awards and decorations include the Bronze Star Medal, the Purple Heart Medal, the Good Conduct Medal, the National Defense Service Medal, the Global War on Terrorism Expeditionary Medal, the Global War on Terrorism Service Medal, the Army Service Ribbon, and the Army Reserve Overseas Service Ribbon. Alan is survived by his son Dakota, his mother Karen Moore and father Edward Burgess and his extended family.